Ludhiana, April 06, 2019 (News Team): Sat Paul Mittal School started the Class XI session with a bang with an assortment of enriching activities which culminated with the Fresher’s Party on 6th April, 2019 in the school premises. The objective of such an event is to provide an opportunity to familiarize the new batch of students with the existing ones. Ms. Bhupinder Gogia, Principal, Sat Paul Mittal School graced the occasion with her presence. The venue was packed with enthusiastic freshers who had brought their zest for life along and it was reflected in the revelries. There were smiles all around as the students mingled with each other. The young Satyans looked chic and savvy in their outfits. The function commenced with a welcome speech followed by glittering dance and exhilarating singing performances by the students. A Talent Hunt show was organized for freshers to exhibit their talent in various forms through soul stirring activities which enraptured the audience. As disco lights flashed and pulsating music blared, the ambience manifested youth and enthusiasm. There was music in the air and laughter reverberated through the venue. The beautiful damsels and handsome lads of Class XI left the judges spellbound and made the task of judging their amazing talent very painstaking. Eventually, Bhavik Jain was declared Mr. Fresher and Aarushi Syal was declared Ms. Fresher. The other awards were given to Mahineer, Aaira and Shyra Mishra for best singing; Medha and Sarthak for best dance performance; Romita for best Orator; Esha for best Artist; Jodhpal Singh and Pranav for best rappers and Kunvarveer for best Intrumental music performance. It was a fun filled event where the new students got a chance to showcase their talent. The event was full of enthusiasm and thrill. 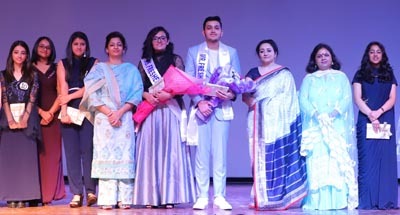 Acknowledging the efforts of students and teachers towards organizing the event, the Principal, Ms. Bhupinder Gogia gave away the titles to the winners. She motivated the students to excel in every aspect of life and wished them success.